Situated in the heart of Mangawhai Village only a short walk to Dune the tavern and Bennetts Chocolate shop and much more.With the estuary only a short walk away and the beach a 5 minute drive you have everything on your doorstep. 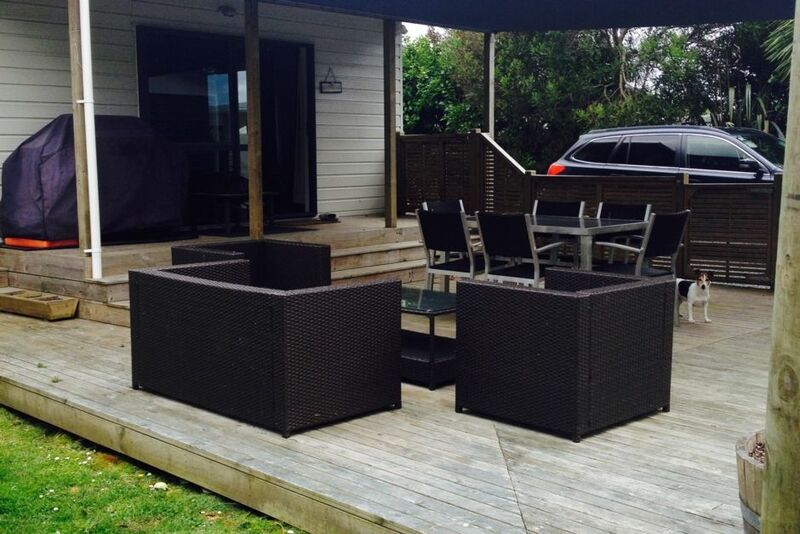 This brand new Holiday house has a large covered deck for entertaining with a gas bbq and great outdoor furniture and is fully fenced so bring the dog . It also has a self contained sleepout for the parents or teenagers! Sky television [including sport] and dvd player available. Heatpump to keep you warm in winter and cool in summer. There is also some space for tents. So whether you enjoy surfing, swimming tramping or just relaxing with a glass of wine and good food Magical Mangawhai has it all. one nights deposit is required when booking. Great place to stay, very spacious and well set up with everything we needed. Our first impression was- "this isnt like the photos- its WAY BETTER!" The home is roomy and has everything you need. Very convenient walking distance to the shops ( only a couple of minutes). It has a big outdoor area with lots of seating- also a big sail for protection from sun. We were a bit surprised that we had to take own sheets and towels, but the owner provided them ( for a small cost) when requested. Would definitely recommend for a relaxing break away. Excellent property. Bed was comfortable and plenty of hot water. Dogs were well catered for with a secure backyard, plenty of shade and an excellent off leash walking area nearby. Everything we required was in the house and worked. Would recommend property especially if you have dogs.